Fu-dogs are actually lions. In myth, they guard the god Fu, and somehow came to be known as Fu-dogs. They are usually made in a pair. In folk-lore, they stand for justice and prosperity, and are supposed to guard against misfortune. A male’s paw is usually shown stepping on an orb, symbol of power, and the female’s on a cub, symbol of continuous life cycle. 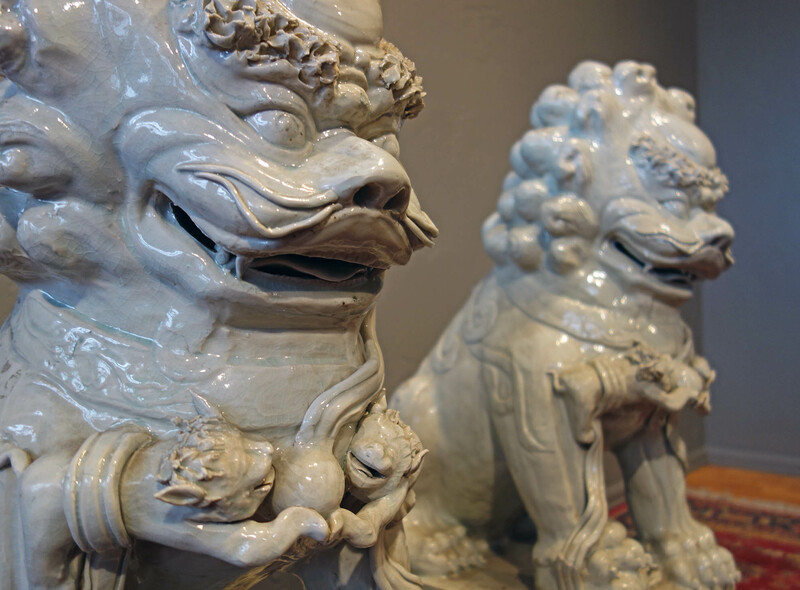 Each Fu-dog shown here has a knobby mane and a body with fur defined by relief carving of hooked swirls parting from a center “spine” defined by several nodes. Each has a face with bushy eyebrows, whiskers, and a wide grin that shows its tongue. Each has two cubs lashed to its chest with ribbons. The male dog steps on an orb, and the female on a cub. 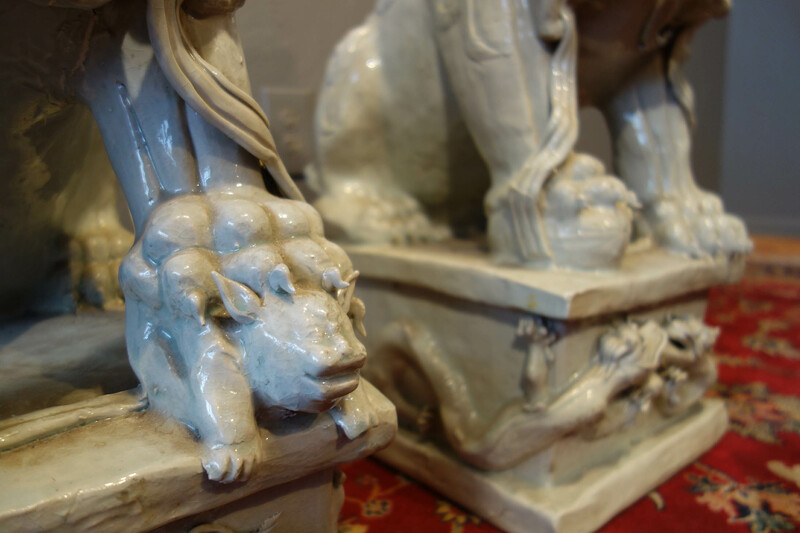 The blanc-de-chin deep base each “dog” stands on shows a pair of small confronting dragons. 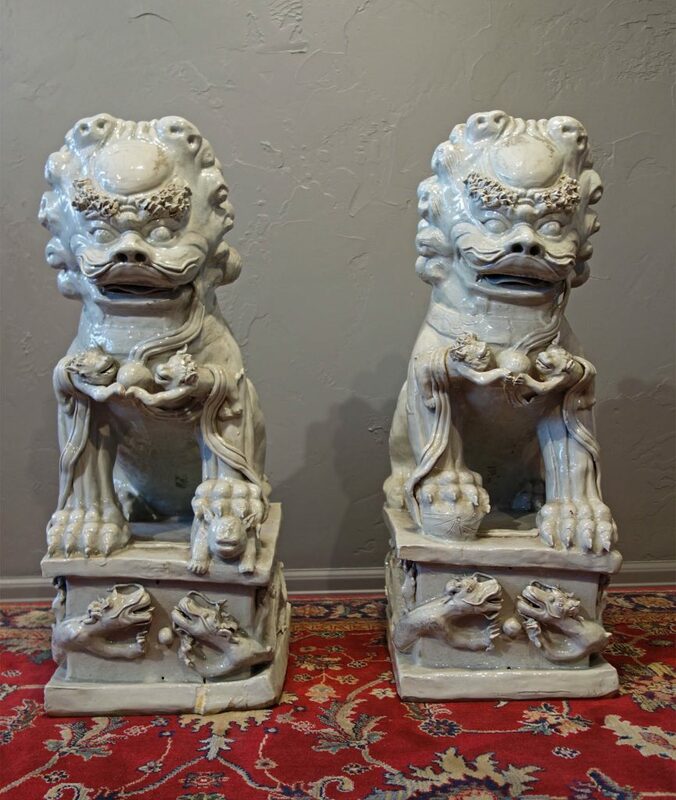 This pair of blanc-de-chine Fu-dogs has a white glaze with a hint of blue. This hue, in some publications, is said to be the true color of old blanc-de-chin. Others claim ivory white or hint of yellow to be true. At any rate, vintage pieces often have cracks from imperfect method of firing in the early days, and this pair shows cracks and mottling patches from old glaze peeling off. 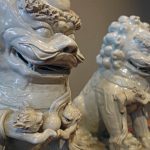 A pair of antiquated blanc-de-chine Fu-dogs is quite hard to find today. 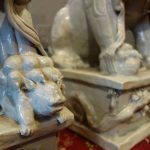 It should not be placed outside as weathering could damage it, but it would look wonderful by a doorway inside, at each side of a piece of furniture or fireplace.